Wendy’s Chili just can’t be beat. Wendy’s makes this classic recipe fresh every day, and you can do the same. You can make Wendy’s Chili Recipe just like they do. Tomato juice really enhances the flavor of this chili, as does the chili powder, though you may want to start off with a little less chili powder. I find that 1/4 cup isn’t too hot, and is still very flavorful. Now, it is said that Wendy’s chili is made from grilled hamburger patties that didn’t make it into their burgers. You don’t have you start out with hamburger patties, but the fresh ground beef. We think it is easier to start out this way when you make your own chili. We suggest that you brown the beef very thoroughly before making your chili. If you are a die-hard Wendy’s Chili fan you can start out with about 2 pounds of ground meat, fry it up as hamburgers, but you must cook them until they are very well done. Wendy’s Chili is gluten free. 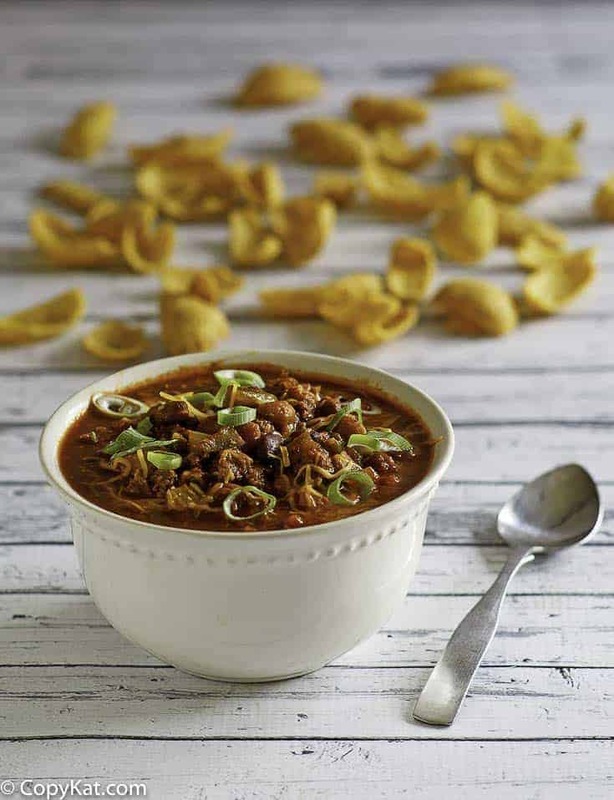 There are lots of fresh ingredients in this chili, and you can put this recipe together in no time. 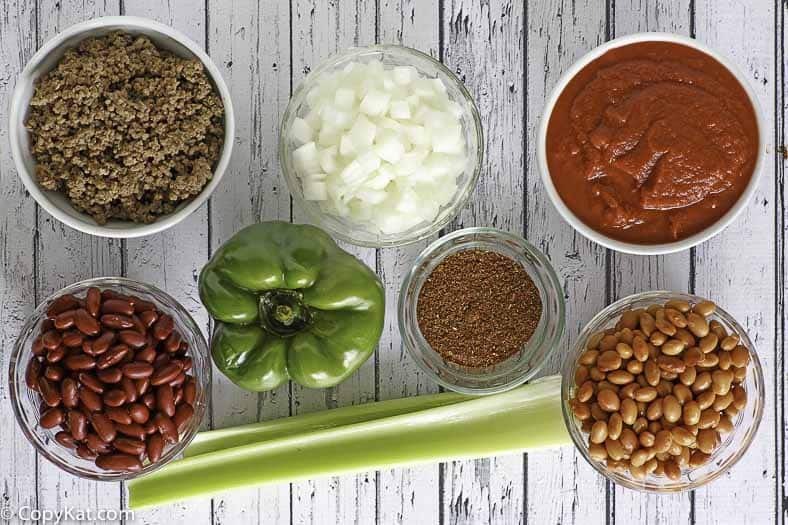 This recipe has onions, celery, green bell pepper, two types of beans, beef, and chili seasoning. 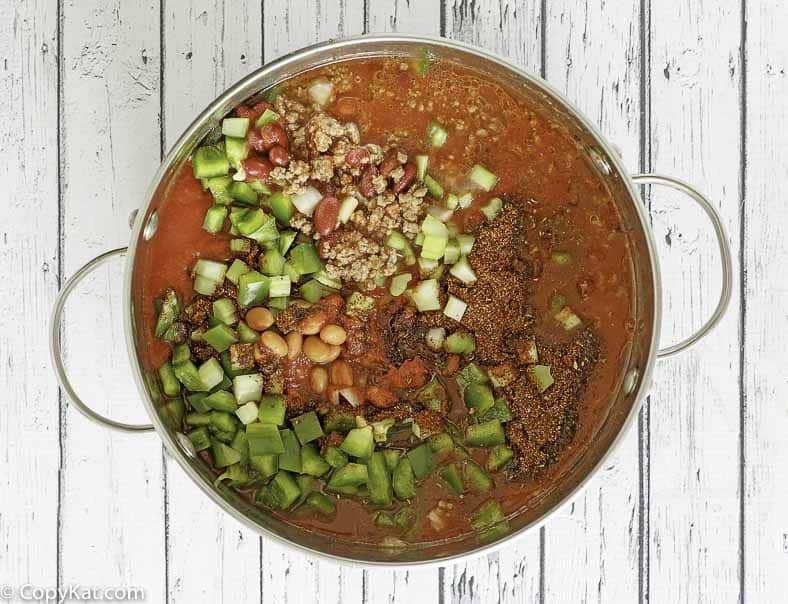 You won’t be disappointed when you make a delicious bowl of this amazing chili from scratch. It is important to cook this chili for the entire time as listed in the recipe. The flavors mellow and change over the cooking time. I understand that some people also feel that 3 tablespoons of chili powder are too much. I think if you stick with standard brands of chili powder this is best. Chili powder is a combination of several spices, there isn’t a chili powder plant. Stick with a well-known brand, and if you naturally like foods that are less spicy consider using less. Again, I fully stand behind the 3 tablespoons as listed in the recipe below. I hope you enjoy this recipe and check out my other Wendy’s copycat recipes. In a skillet, brown the ground beef; drain. Put the drained beef and the remaining ingredients in a 6-quart pot. Cover the pot; let it simmer for 1 to 1 1/2 hours, stirring every 15 minutes. I want to make this. Can you share what brand of chili powder you use? I know that some include a lot of salt. I either use Penzey’s or McCormick. Made this today. I questioned the 1/4 cup of chili powder, but decided to add as directed. My husband and granddaughter absolutely loved the chili! They both requested that I not lose this recipe. I have a habit of making something and not marking the recipe or printing. I threw out my other chili recipes and printed this one and put in my recipe book . That’s how delicious this recipe is. This will definitely be my go to chili recipe. Most definitely a keeper. Oh wow 😉 Thank you! I am so glad to hear your family loved the recipe. I’m so glad that I’m not the only one with this bad habit! Does anyone know what the serving size is on the nutritional information. Doing keto diet and need to know if this will work with it. The serving size is fairly large it is a very full 1 cup serving. Would the tomato puree be the same as tomato sauce or is the puree thicker? The puree is thicker than sauce. In a pinch you could try using sauce. I NEED THE CHRISTOS RECIPE FOR THEIR ROSA MARINARA . NOT SURE OF THE SPELLING.I’M 83 AND CAN’T AFFORD TO BUY IT. PLEASE HELP ME. THANK YOU. Thanks for letting me know, where do you think the flavor was off, I would love to improve the recipe. It says it makes ten servings at 257 calories. How big is the serving? One cup? I believe the serving size is larger than a cup, I think it is about 1 1/2 cups. Question please. I want to make this recipe without any beans. Would the ingredients amounts stay the same? Would I add more beef or just keep everything the same without the beans? Has anyone made it this way? I would keep everything the same, maybe add less liquid. How long would I cook this great recipe in a crock pot and on high or low setting? Low = three hours, high I would do 1 to 2 hours. Love this recipe and I’ve never added beans before. When I make this recipe I’m able to freeze 2 containers. Makes perfect quick meals after work! And still delicious! I have been making chili for 50 years. This is better! I cannot explain why – probably just the right combintion of ingredients but it is perfection. Made the recipe exactly as written, simmered for 3-4 hours, 8 generous servings. I really think it is the tomato juice. I make chili at home as well, and when I don’t make it with the tomato juice, I don’t like it as well. Everything else is pretty standard. I agree Stephanie, and I take it a step further by using spicy V-8. I bet that does make it great. I tried it with the Spicy V8 it takes it there! I added some sirlon tips with my Chilli! This recipe looks great and I’ll definitely give it a try! Has someone tried to make it in a crock pot? Yes I’ve made it several times in my crockpot. Thank you for the info on the meat. That’s great to know. The celery in here is unexpectedly delicious!